Height to 60cm, evergreen, semi-hardy in mild areas (zone 8). For colder areas, or in harsh winters, it is better to bring indoors. 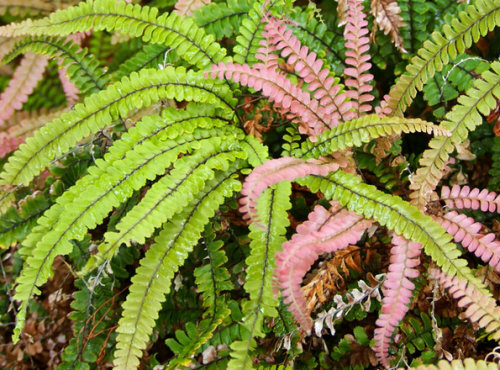 Suitable as a house plant, it is much more tolerant of under-watering than many other Maidenhair Ferns. New growth is red, maturing to green. A delightful, tough Maidenhair Fern. Grow in a well drained compost and do not overwater. It prefers good light and humidity. A. pubescens is found in New Zealand. It is slightly taller and more pedately branched than A. hispidulum.